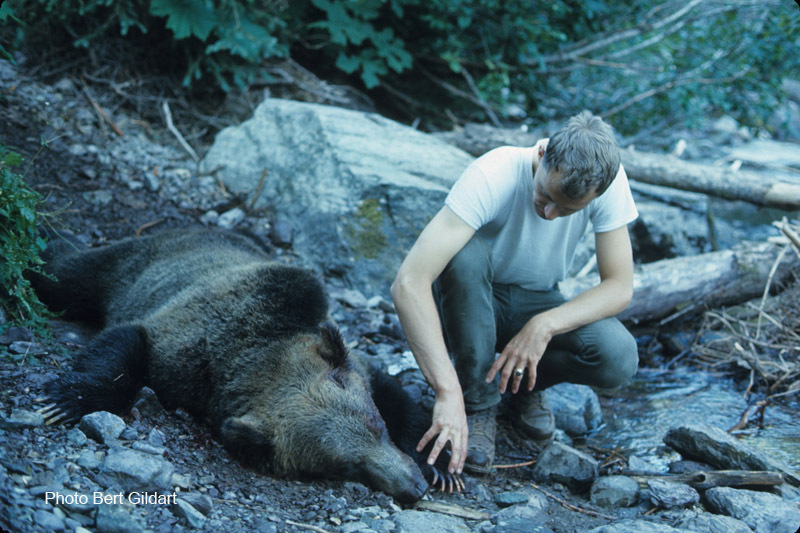 ©Bert Gildart: Fifty years ago from yesterday (August 15, 1967), Leonard Landa and I shot the grizzly bear that killed Michele Koons, the fatally mauled young lady at Trout Lake, whom we had found three days earlier. This then marks the end of the events that have conspired to create so much publicity for those of us involved in the episode now known as “Night of the Grizzlies.” Approximately 10 different publications have related the story and used images for illustrations. I was particularly flattered two Sunday’s ago when the Great Falls Tribune featured an image of mine that ran horizontally across the entire front page of the Sunday edition. The Tribune is one of the state’s largest papers, and the accompanying story filled almost two full pages so extending my 15 minutes of fame to 17. I photographed it about three years ago, and it quickly scurried on, as did I. But Shea is now concerned because hordes of people are descending on Glacier subsequent to last year’s National Park Centennial, and the unprecedented advertisement associated with that event. “The park,” says Shea, “was not set up to contend with a million visitors each of the park’s four summer months.” Shea notes that back in 1967 the park averaged about 100,000 visitors throughout the entire year. Proximity of bears and humans then is the immense problem with which the park must now contend, and if they don’t, the “conditioning” that results from the close proximity of bears and people could very well create two more “killer” bears. Neither Leonard nor I want to hear that two young rangers have found a young mangled girl whom they must then roll into a body bag. That’s an indelible memory Leonard and I share; but along with it we wonder that the parents have survived as well as reported. We both think their grief has been pushed into the background. This entry was posted on Wednesday, August 16th, 2017 at 8:23 am and is filed under Natural History/Conservation, View Point. You can follow any responses to this entry through the RSS 2.0 feed. You can leave a response, or trackback from your own site.